I don't know which is funnier - Oscar's head stuffed in the yogurt container like Winnie the Pooh or Stewie smacking his lips hoping to get a morsel. 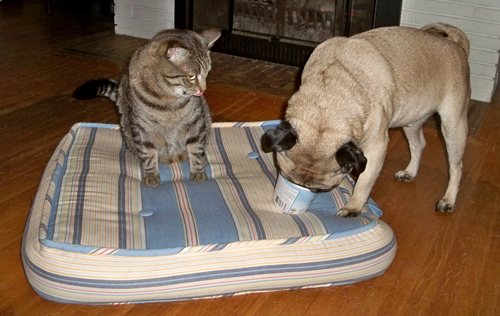 If Oscar is like my Annie, the long pug tongue is going to get every last drop. Hey check this out. I thought of you. I don't think that head coming out of there anytime soon.